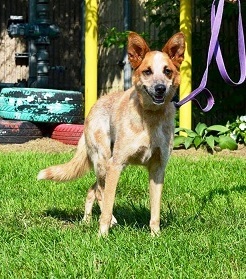 A ROSIE or ROSEY Spelled Either Way is Still a Red Heeler So SWEET…. Our ROSEY is from Kentucky where she was like a nanny to the young kids. 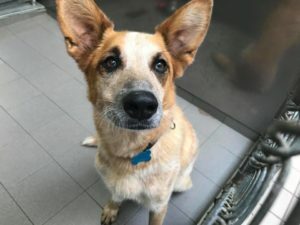 She was surrendered because her owners feared for her safety. ROSEY was too interested in the neighbors’ chickens. She pulled the 7 yr child old on the skateboard. 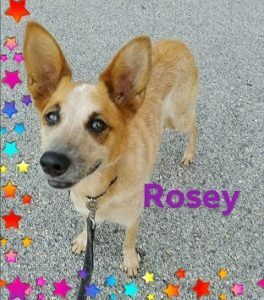 ROSEY is smart..knows SIT & PAW…loves to play with toys…and should do well with other calm dogs. But she doesn’t get along with cats. ROSEY is a beautiful girl with lots of FAMILY DOG potential. This entry was posted in Adopted, Adopted Dogs, Adult, Dog Center, Dogs, Female. Bookmark the permalink.